Okay, nature lovers! Fall, as you know, is a great time for color. Take a stroll outside and gather whatever outdoor elements strike your fancy. Surely you can find a handful of leaves, flowers, or twigs to fashion into a wreath, or to drape around the threshold of your door. 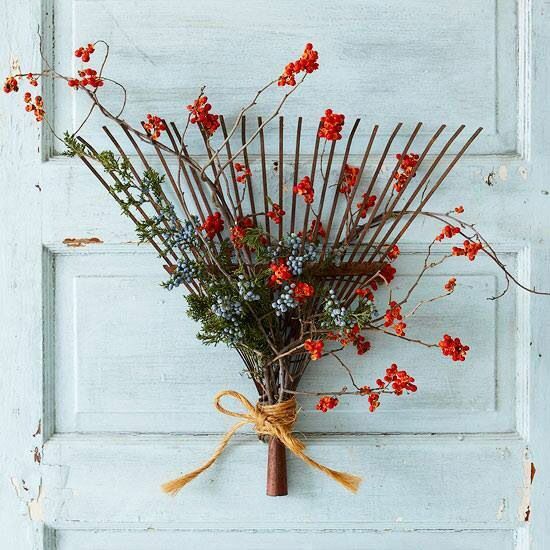 Check out this flower-and-berry-festooned rake. Simple, yet bound to start a few conversations! If fall is your favorite season, why not let it show? 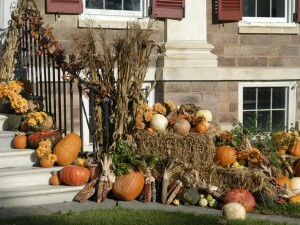 Bales of hay, pumpkins, gourds, corn, and whatever else tickles your fancy can be set up around the entry way. You can make your display as large as your yard will allow. You needn’t spend a fortune. 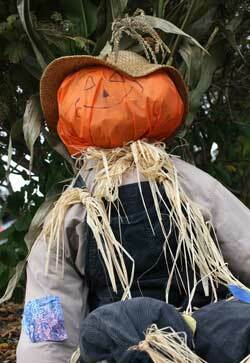 Indeed, many setups only require a trip to the local pumpkin patch. You’ll be good to go.